Defense Attorney: Kindly speak English and drop the vernacular. Curly: Vernacular? That's a doiby! When you're as comically inept as the Three Stooges, you often find yourself on the wrong side of the law. But in this collection of shorts, they not only find themselves pursued by the law but enforcing it in their own unique ways. In Calling All Curs (1939), the boys are animal surgeons. When dognappers steal the prize poodle Garçon out from under their noses, they're forced to turn detective. A fairly mild outing for a Curly short, with three face slaps, two eye pokes and only three conks to the head. The notorious public domain short, Disorder in the Court (1936), finds the Stooges in court as the star witnesses in the mystery of who killed Kirk Robbin. There are a number of classic Curly moments here, such as the great swearing-in sequence and a floating tic-tac-toe game. The Stooges' humor is more verbal than usual here, possibly in an effort to make them more like the Marx Brothers. The presence of frequent foil Bud Jamison as the defense attorney is an added plus, since he plays off the Stooges so well. One of the most violent shorts, with four eye pokes (plus a blocked one), four face slaps and a full dozen conks to the noggin (plus Curly's head in a letter press for good measure). Dizzy Detectives (1942, not 1943 as listed on the case) starts with the guys as carpenters who are taken on as rookie gumshoes. They're after the mysterious Ape Man (yes, a man in a gorilla suit, the fallback of all comedians in desperate straits). It still works well, and Curly has some great moments. Six face slaps and seven bonks on the bean keep the action furious. It seems that whoever was programming this disc only looked at titles and didn't check out the films proper. 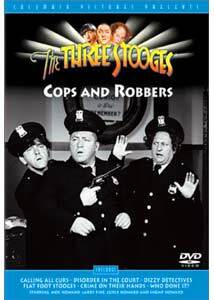 Despite the title, Flat Foot Stooges doesn't refer to the police force. The boys are instead members of the fire department, which predictably catches fire. The low budgets are really showing here; Moe muffs a line but the scene stays in the picture nonetheless. One of the weaker entries on the disc, but it's still worthwhile because of Curly. Notably, this short was one of a handful of Stooge shorts directed by silent comic legend Charley Chase. Five face slaps but only one poke to the eye and one clock to the head. Yes, it's another guy in a gorilla suit in Crime on Their Hands (1948). This time out, the Stooges are janitors at a newspaper who jump on a tip about the stolen Punjab diamond to make themselves cub reporters. Christine McIntyre is the blonde fatale in this and the next short as well. There are a few good moments when Shemp swallows the diamond and the hoods come up with methods for extraction, none of which really appeal to Shemp. Six face slaps and an even six conks to head, but the eye pokes are gone. Wrapping up the package is another Shemp opus, Who Done It? (1949). Emil Sitka, who would briefly be offered Stoogehood after Larry suffered a stroke in 1970, is Mr. Goodrich, who is kidnaped by the Phantom Gang. The Stooges, as the Alert Detective Agency, try to unravel the mystery, which thankfully involves no one in an ape suit. Only two face slaps but an amazing 21 blows to the head make this a satisfyingly violent conclusion to the package. Image Transfer Review: The full frame image is generally quite nice indeed; Curs looks exceptionally good for a short from the 1930s. Disorder in the Court, usually seen in miserable or worse transfers on public domain collections, looks the best I've ever seen it here. The picture's a little beaten up, but the defects are mostly in the form of speckles and not any serious frame damage. The worst appearing short is Dizzy Detectives, which tends to be rather over-contrasty, with blacks lacking any sort of detail. But on the whole this is quite an acceptable-appearing collection. Audio Transfer Review: The 2.0 mono track sounds reasonably good considering the age of these shorts. There's no significant hiss or noise apparent on any of them. Flat Foot Stooges has a slightly distorted sound, but everything's quite clear and there's little to complain about at all. Extras Review: Other than subtitles, there's nothing here for extras. There's no Play All function, either, which is irritating. How hard could it be to program that into the disc menu? Six vintage Stooge shorts, with a full four Curly shorts in the mix, in a rather nice transfer. Still no extras, but an attractive package nonetheless.